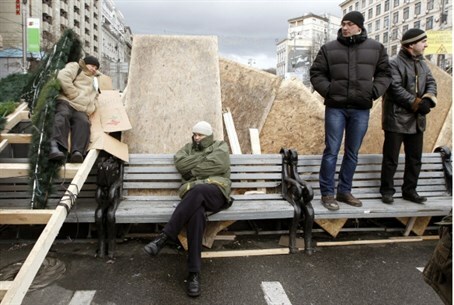 Thousands of demonstrators besieged government buildings in Kiev Tuesday, rallying against President Viktor Yanukovich's decision to abandon a long-awaited deal for closer ties with the EU. A group of protesters tried to storm Yanukovich's office and police chased protesters away with tear-gas and truncheons, injuring dozens. At least three politicians from the governing Party of Regions have quit in protest and one of them, Inna Bohoslovska, previously a vocal government supporter, called on other legislators to leave the party. A top Agriculture Ministry official also resigned on Monday. The opposition hopes to topple the cabinet of Prime Minister Mykola Azarov during a confidence vote in parliament on Tuesday. It would need 226 votes in the 450-seat Rada, but presently controls about 170 seats. Yanukovych reached out to the European Union on Monday requesting new talks, but the EU told him that the sweeping trade deal he refused to sign last week after six years of talks wasn't open for renegotiation—and warned him against using force to disperse the crowds in Kiev's main square. A U.S. State Department spokeswoman voiced concern Monday about violence against demonstrators, and insisted that "European integration is the surest course to economic growth" for Ukraine. Across the former Soviet Union, Moscow's increasingly tight embrace is forcing governments that had long sought to maneuver between Russia and the West to choose sides. In his first public comments since riot police broke up antigovernment demonstrations, Yanukovych defended his decision to back away from the EU agreement, saying it would not be worth the cost, in terms of lost trade with Russia. "What kind of agreement is it if they take us and bend us?" Yanukovych asked in a nationally televised interview Monday. "I, for one, think we shouldn't give in, we should defend our own interests." Russian President Vladimir Putin has threatened economic retaliation if Kiev pulled closer to the EU. Putin said the protests in Kiev "remind me not of a revolution but of a pogrom," adding that they were aimed at shaking Yanukovych's "legitimate government." “A deepening economic crisis and waning patience in Moscow and Brussels have made the balancing act that the [Ukraine] has played out since independence in 1991 less and less tenable,” explained the Wall Street Journal. Three opposition leaders, including the heavyweight boxing champion Vitali Klitschko, called on Yanukovych to resign on Monday. After meeting with the far-right nationalist leader Oleh Tyahnybok, and Arseniy Yatsenyuk, a key ally of the jailed former prime minister Yulia Tymoshenko, Klitschko said: "Yanukovych is simply not fit to rule.". The three hope enough of Yanukovych's own supporters join ranks with them to force a no-confidence vote in parliament on Tuesday morning. On Monday, the interior ministry said a total of 150 riot police and other officials had been injured, while 165 protesters had been injured.